Italo is the first private high-speed rail network operator in Italy, and the first operator in the world to use the new Alstom AGV train, which holds the high-speed train record. With its fleet of 25 trains, Italo provides journeys with a wide range of entertainment and personalized services in absolute comfort, geared towards the needs of all types of travelers. To increase the national coverage of its service, Italo approved the purchase of 12 new trains from Alstom. These “EVO” trains are the evolution of the “Pendolino” family with proven reliability and high performance, and will join the fleet from December 2017. Italo’s mission is to provide passenger services on high-speed rail lines, innovating content and enhancing the travel time. * Compared with the same quarter of the previous year before the improvements introduced with MailUp. We wanted an easy and fast tool to support our business strategy. The MailUp platform is the perfect tool for growing our audience and keeping our customers. Italo uses direct mailing as part of its corporate priority communication channels. EMAIL, WEBSITE, SOCIAL MEDIA, APPS, TV and RADIO are the main dissemination tools used by the company, which transmit a single “Travel with Italo” call-to-action, while tailoring the means of communication to the channel’s individual dynamics. 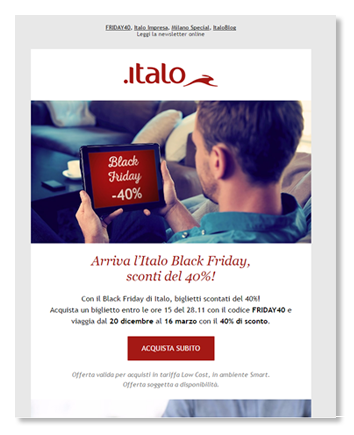 That’s why Italo decided to optimize its email campaigns by taking into account the mode of use and various requirements of its communications’ recipients. Italo also decided to head toward an increasingly mobile approach that focuses on improving delivery results. Every action has been tailored to the target according to their type of relationship with the company. To improve the technical aspects and newsletters: mobile-responsive, readability and content chunking. To differentiate communication based on its various targets (digital-loyalty-trade). To streamline and personalize the various targets’ templates. To optimize delivery and, in turn, the performance of email campaigns. To redefine the mode of interaction, the communication flows and email creativity were reviewed using the BEE Drag & Drop editor. With the guidance of a MailUp design team, the layout of the campaigns was redesigned, focusing on the text/image/call-to-action ratio. Having established the 3 types of target (digital/loyalty/trade), 3 communications were created with distinct colors to make them more recognizable. The emails were then divided into different communication groups: the first 2 groups dedicated to commercial offers (most clicked in past campaigns) and a third group dedicated to studies on not strictly commercial products or promotional activities with partners. Every template was made taking account of the parameters for mobile displays, so that the communications read using this channel remain unaffected. Then, a detailed analysis was launched on the openings and bounces of the various campaigns to monitor any areas of weaknesses that could be improved. The support provided to Italo by the team of deliverability experts was especially key in identifying a segment of inactive customers based on the campaigns sent. After two ad hoc analyses (performed after 1 month and then 6 months of using the platform), MailUp’s deliverability team was able to monitor the most inactive target users in past campaigns for users with emails from foreign servers: 75% of users with foreign emails did not open or click Italo’s communications and/or even reported the emails as spam. Following MailUp’s guidance, Italo started sending these users communications with promotions in English to regain interest in the company’s email communications. Thanks to the personalized templates developed with BEE, Italo can independently manage and tailor its campaigns by type of recipient, streaming and boosting the time efficiency of its various communications. The responsiveness to promotional emails was optimized, increasing the performance of activities on its purchasing channels and on the communications themselves. Always keep email in mind as an integral channel of your digital business strategy. Tailor your email message based on your targets’ use and habits. Analyze the data and results of your mailings to optimize your campaigns’ content and the modes of interaction with your target. Monitor inactive users and develop targeted and differentiated communications to regain interest.